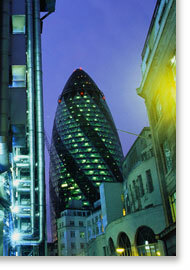 London's Swiss Re Tower by Foster and Partners, also known as the Gherkin Tower (built 2001-2004) is billed as one of the most advanced sustainable office towers in the world. Lloyds Building by Richard Rogers Partnership (1979-1984) in the foreground, is a monument to high-tech symbolism of another era. Both London buildings are home to members of the global insurance industry, long alarmed about the urban impacts of climate change.